Should We Be Bullish or Bearish On U.S. Economy & Equity Markets? The above introductory comments are edited excerpts from an article* by “Armchair Quarterback” as originally posted on SeekingAlpha.com under the title The Bull Market In Equities Has A Long Way To Run. 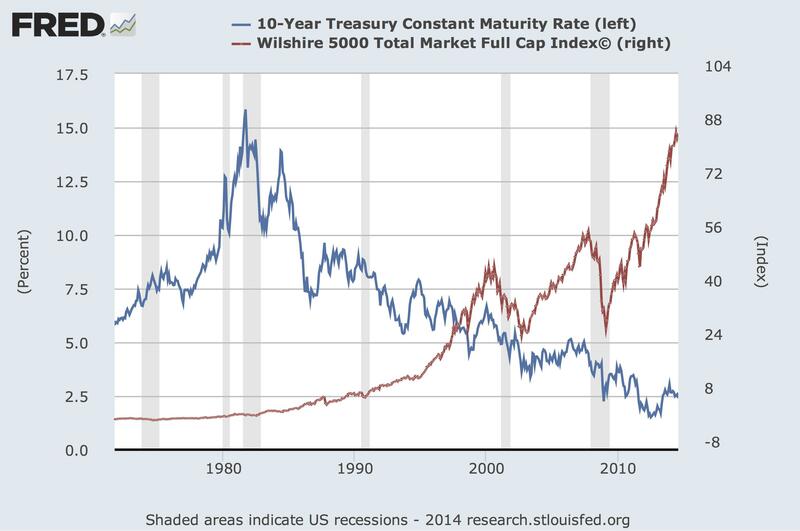 First, let’s put the current interest rate and equity market into historical context. How long will these two bull markets run? Do we see any signs of a turnaround? To answer this question, we look a little closer at the current business cycle to assess where we are in its progression. Historically, the slope of the yield curve has been an accurate predictor of the business cycle. In the graph below we have plotted the difference between the 10 year constant maturity (“CMT”) UST rate and the 1 year CMT UST rate. This indicator fits well with the business cycle. The slope accelerates upward through a recession and is at its steepest soon after a recession during the early phase of an economic expansion. eventually turning negative (yield curve inverts) just prior to a recession. 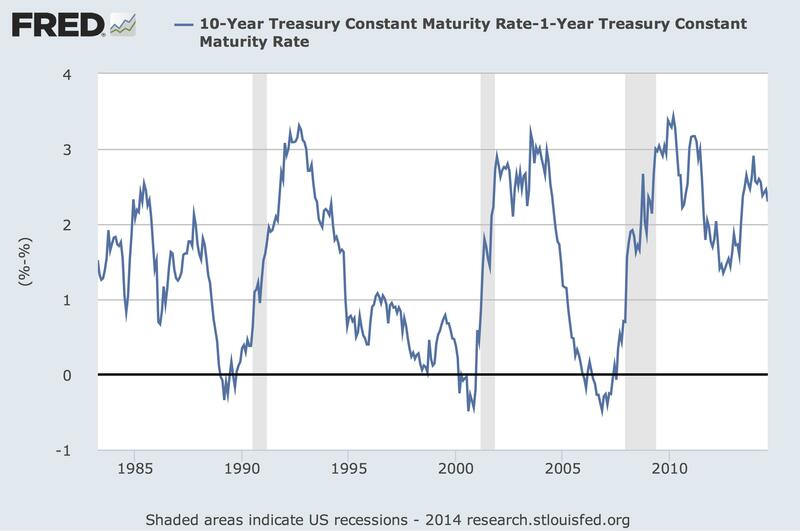 As you can see above, there were a couple of false readings of inverted yield curves with no immediate recession but there were no instances of a recession while the curve was flattening after displaying a positive slope. Even the false readings were slight, temporary, and eventually predicted a recession. The overall cycle of the shape of the yield curve fits nicely with the economic cycle and indicates that we are currently nowhere near a recession. [Below] we present our thoughts on commercial lending activity, banking reserves, and household credit capacity. All indicate plenty of capacity and the ability to drive the economy forward for several years to come. 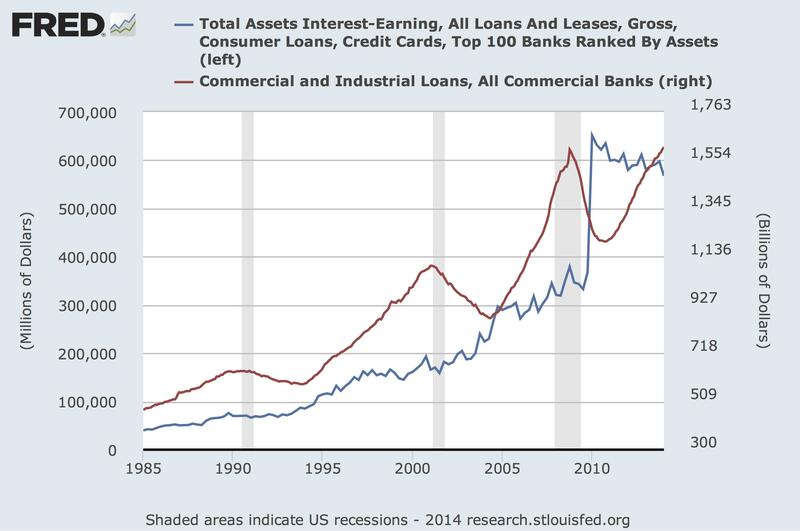 Bank balance sheets have peaked but this masks underlying loan growth. Although total interest bearing assets of the top 100 banks in the U.S. have remained level (even decreasing slightly) since 2010, underlying commercial and industrial loans (red line below) have grown at a good pace. 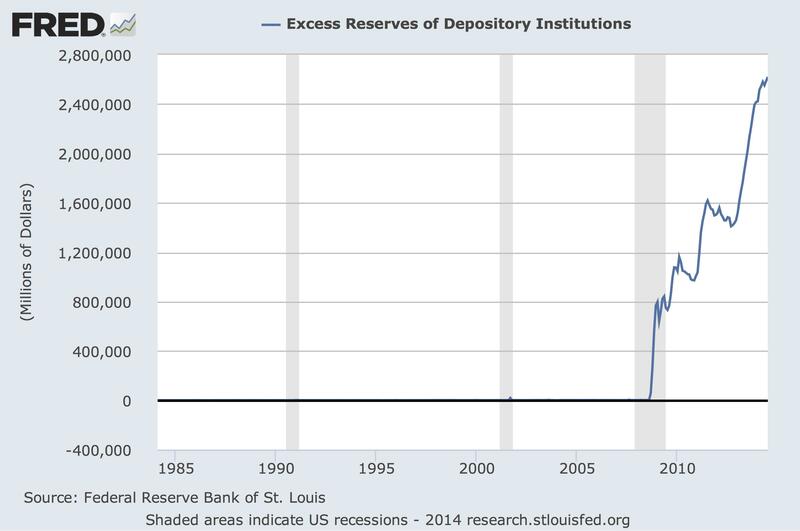 Total assets of banks have been skewed by the extraordinary purchase of non-productive financial assets immediately following the global financial crisis and don’t imply consequences for the economy. However, the rate of change of commercial and industrial loans fits nicely with the business cycle. turns sharply downward until private sector credit demand returns. Currently, we see loan growth (the red line) on an upward slope with no indication of flattening or reversing. 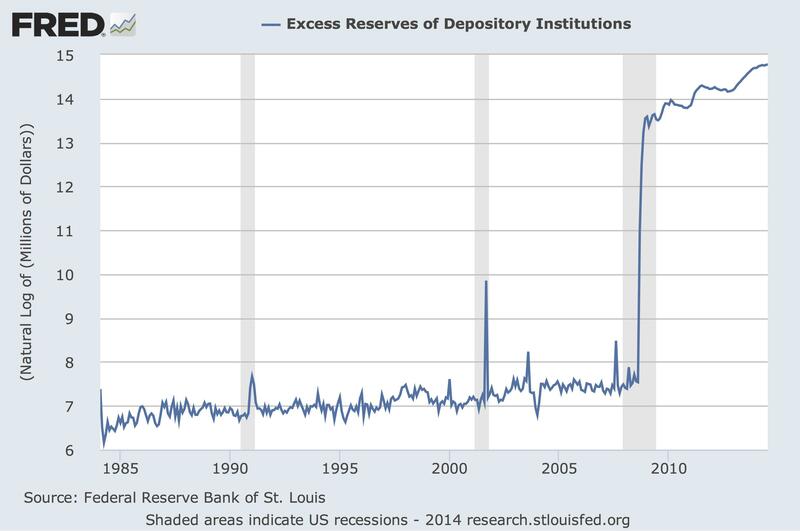 Reserves are high in part due to changing regulations, but at these levels, credit creation will… accelerate as confidence and sentiment continue to improve. The picture looks the same even when considering the data in log scale. 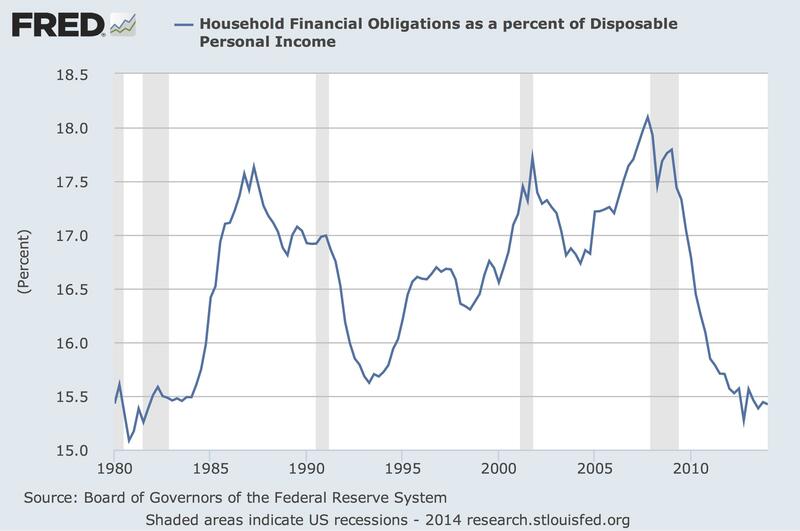 Household debt service payments as a percentage of disposable income are the lowest they have been in three decades. Although mainstream media stories abound of pinched consumers facing hard times, the data indicates that households certainly have the capacity to increase spending and incur additional debt to power the next phase of economic growth. The current S&P P/E ratio is 18.55, as reported by the Wall Street Journal data center, and 19.39 as reported by Barron’s. This is relatively high but within a historical range we might call normal. Consensus estimates of earnings vary, but with our bullish view on the market, we would not be surprised to see EPS for the S&P 500 grow by between 8% and 10% year-over-year. Based on our expectations of earnings growth and a slight expansion in the P/E multiple, we would not be surprised to see the S&P 500 index reaching 2400 by December 2015. In summary, we are bullish on the economy and the equity markets in the U.S.. We see no signs of disruption beyond an exogenous geopolitical event. 1. What Does the “Market Map Model” Say About Future Direction Of U.S. Stocks, Interest Rates & Commodities? 7. What Are the 2 Catalysts That Cause Major Market Corrections Telling Us Today?